Everything you need to know about investing in Helmerich & Payne on a long-term basis. All too often, market pundits talk about a topic like the oil and gas market in a way that makes it a seemingly impossible thing for everyday investors to understand. Sure, if you are trying to determine what this market will do tomorrow, chances are good that the answer will be complex and nearly impossible to pinpoint. For longer-term investors, though, the movements of the industry are much easier to understand. The following seven charts explain pretty much everything you need to know about rig company Helmerich & Payne (NYSE:HP). Let's take a look at these charts that show the state of the rig market, where H&P is positioned in that market, and how it's the best investment in the industry. Drilling into shale reservoirs and using techniques like hydraulic fracturing isn't anything new in the oil and gas business. The difference today, though, is that we have learned how to do it in a much, much cheaper way. In fact, shale drilling across the U.S. has become one of the lower-cost methods of extracting oil and gas available. This has completely upended oil and gas drilling in the U.S. Less than a decade ago, horizontal drilling -- one of the key components of shale drilling -- was an afterthought. Today, it is the predominant type of drilling used by producers out there. Thing is, you can't use drilling equipment from the 1970s to do horizontal drilling. It takes higher-horsepower rigs with better specifications, and today most producers want rigs that can move quickly from one well to another in a way that allows producers to drill a dozen or more wells at a single drilling site. This has given rise to high-horsepower rigs that run on alternative current rather than require direct current as the older rigs did. Because of the trend in the type of drilling going on today, we're seeing a large shift toward these newer, more powerful rigs. So we have producers that aren't using as many rigs as we have seen in the past, because of low prices. When they do rent rigs for use, though, we're seeing a trend toward paying up for better technology and higher horsepower. This plays precisely into Helmerich & Payne's long-term strategy. Over the past several years, it has been turning over its fleet of rigs such that almost all of them are high-horsepower rigs. What is even more promising, though, is that the company has lots of these rigs ready to go to work when the industry picks back up again -- much more than any of its peers Patterson-UTI Energy (NASDAQ:PTEN), Nabors Industries (NYSE:NBR), Precision Drilling (NYSE:PDS) and Unit Corporation (NYSE:UNT). When the market does pick back up again, Helmerich & Payne will be ready and will have an immense opportunity to profit. It has only 92 active rigs today. So a fleet of close to 250 rigs ready to go shows how much farther this company can run. One thing that is surprising about Helmerich & Payne is that the company charges a premium compared to its peers. Its average margin on a rig is just north of $12,000 per day, while the industry average is closer to $9,000 per day. Yet companies continue to turn to Helmerich & Payne for its high-horsepower rigs in this down market in which every penny is precious. Of the active rigs in the U.S., Helmerich & Payne has the largest market share. Having all of these advantages doesn't mean squat if the company can't turn a profit, but that is probably where Helmerich & Payne rises the highest above its peers. 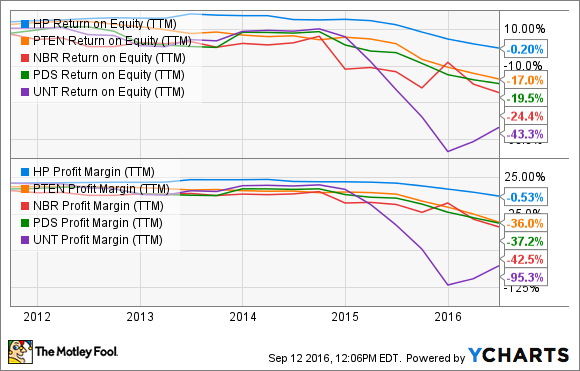 Even in today's dismal rig market, the company's profit margin and return on equity have just barely slid into negative territory, while its peers have all fallen off a cliff profitability-wise. HP Return on Equity (TTM) data by YCharts. Part of that has to do with that higher price Helmerich & Payne can command for its equipment, but it's also because the company hasn't burdened itself with loads of debt that saps profits. It's also comforting to know that Helmerich & Payne's management has been a good custodian of shareholder value. For more than 42 years in a row, the company has raised its dividend annually, and today it sports a yield of 4.7%. It's not that hard to understand Helmerich & Payne. Its rig business is cyclical, but it's in the middle of a structural change -- and the company is at the forefront of this change. It also has the benefit of being a more nimble company since it isn't burdened with a legacy fleet or an onerous debt load. All of these things show why H&P is the best company in the rig market and remains an attractive investment today.